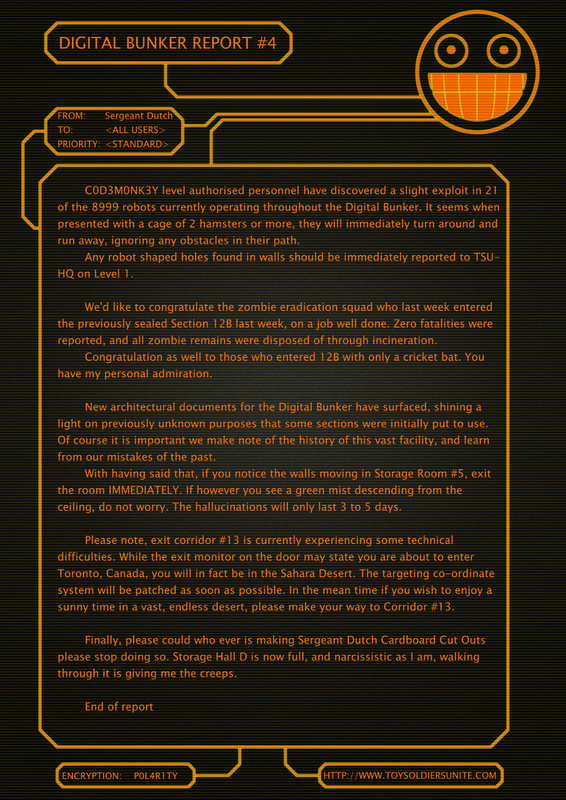 Digital Bunker Report #4 has arrived on all terminals available to Toy Soldiers. Please stop trying to enter the Konami code on the reports, nothing happens. The Toy Soldier Map on the other hand…. Previous Previous post: Spotlight on Toy Soldier Artist / Seamstress: YJ Caecilia Kolibri! Next Next post: Spotlight on Toy Soldier Electronic Craftsman: Sgt. Voltor! So… I shouldn’t have pulled those wires from the system? *inhaled some of the green mist* Wheeeeeeeeeeeeee look at all the cute little gnomes! And lookie at all those beautiful colors! Also, is it just me, or is the bunker starting to look(and act) more and more like Warehouse 13?